Nneed something to read? I can thoroughly recommned this lovely author Punam, her first book Playing with Plant pots will get you salivating as you read about the exploits of growing on her allotment and taking that food into the kitchen. Recipes included – try the saag, it’s delicious! I was sent a copy of this book to review! At first glance this is a pretty book with lots of pictures. when you look more closely it’s actually more than that. It’s got tons of useful information in on how to decide what pots and containers to use, what compost, how to plant things up as well as post-planting care like watering and feeding. The first part of the book is great for people new to gardening, but also a nice flick through with hints for more experienced gardeners. The photos will inspire you, the ideas will make you want to grow different things this year and in the combinations in the book. The plant arrangements are ornamental and designed to show off the height of plants, to create beautiful pots of colour and edible goodies for your garden. One of my favourites in the book is the ‘Summer cocktail’ where you plant borage, strawberries and burnet together. You can use these to make a delightful summer drink! Just what you need after you’ve finished watering the plants on a summer’s evening. People will a small garden will love this inspiring book, and people with a bigger garden will take ideas from it to make beautiful tubs of plants for patios and seating areas. The designs will infuse your spirit with an urge to grow and create beautiful plant arrangements. It’s almost like flower arranging, but starting from tiny plants or seeds. The end is help in thought and the planting scheme supports each plant. There are delightful recipe ideas too which encourage you to use what you’ve grown. This is a lovely touch encouraging the sharing of flavours from the pot to the plate. 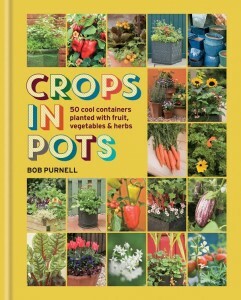 The book finished with a round up of vegetables, herbs and fruit you could grow in containers. This book will be great for people who need inspiration for their garden, or just more ideas on what to do to brighten up a corner of a small space. It’ll show you that you don’t need a big garden to crop tasty things to eat!